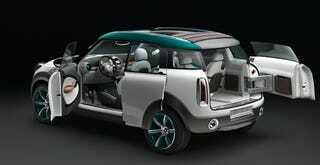 Mini Crossover Concept: Awesome, Awful or Average? Beauty may only lie skin deep, but it can be argued that the Mini Crossover is hiding all of its beauty below the surface...a surface which reminds us of a startled hamster. Opinions have varied on the vehicle and we'll attempt to reserve as much judgment as we can until we see it in person. We can say that the interior features a number of smart touches of the kind that tend to separate Mini from its competitors. What do you think? Awesome, awful or just average?